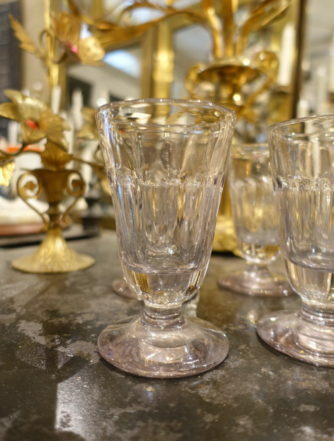 Antique glassware can create a personal and unique addition to your table setting, and add that touch to your home. 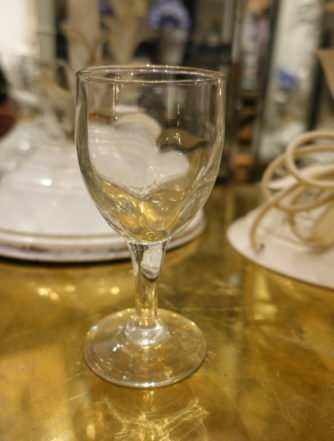 All our vintage glasses are carefully selected, and we attach importance to both their historical and aesthetic value. 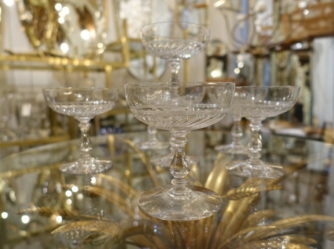 You will find everything from twisted and long bistro glasses to prettily engraved hand blown wedding goblets. 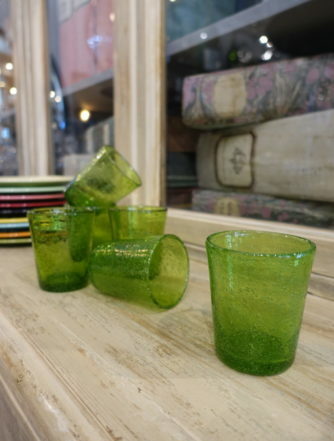 Use the preloved glasses to drink from, for tea lights or as vases. 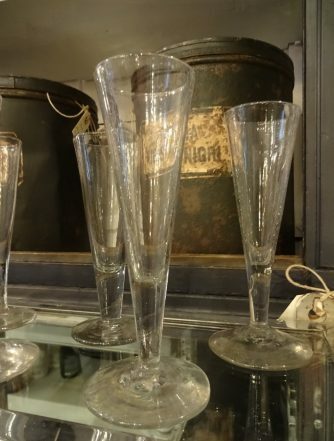 Whether you’re on the lookout for antique glass for everyday use or a special occasion, we have a wide range of elegant glasses in our selection. 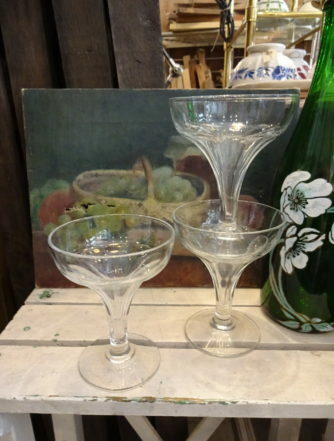 All our glasses are carefully chosen and brought home from secret places in France. 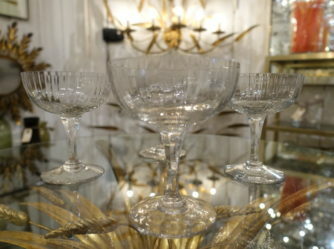 We can therefore ensure you only the rare one-of-a-kind glasses which you won’t find just anywhere. 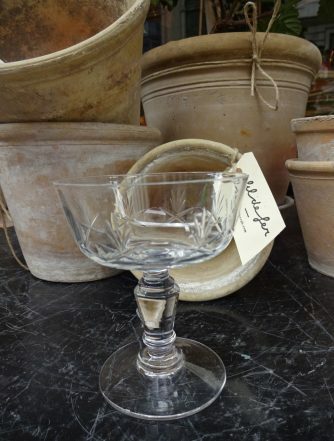 Some of our exclusive glasses are ancient souvenir glasses, only produced in minimal amounts. You can be sure of a unique selection for your red wine or cognac. 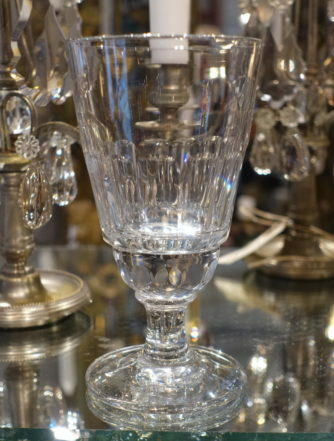 Amongst the most elegant of our classic French glasses, our beveled crystal glasses stand out. Their delicate material and shining shapes ensure a seductive and romantic experience when entertaining – a dimension of indulgence and thoughtfulness. 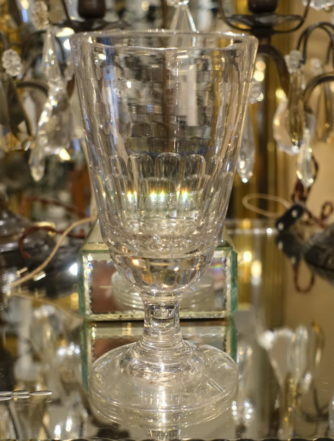 Our French hand blown glass or charming glass trophies add a genuinely stunning and authentic touch. When something special happens in your life, it should be celebrated. What better way, than sharing a bottle of chilled champagne with those closest to you? 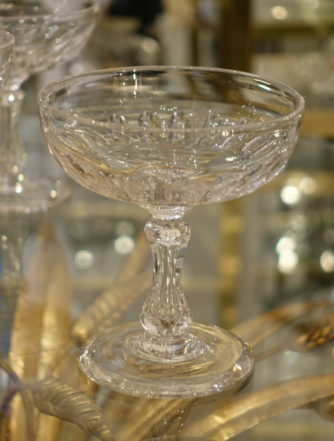 How lovely to be able to serve the bubbles in antique champagne flutes or bowls, taking one back to the decadent France of long ago? 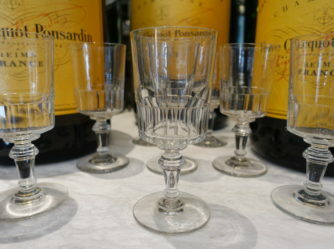 Fil de Fer love to serve a glass or two as well for our guests. And what better way for the occasion than with the right glass? 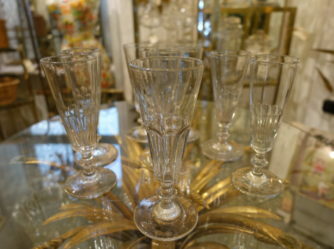 Our vintage French wine glasses and bistro glasses carry tales of festive occasions and late evenings of conversations and friendship. 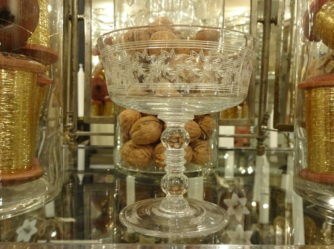 We simply love the antique port glasses, which are truly in their right element when guests come to dinner, or to serve with ris à l’amande on Christmas Eve. 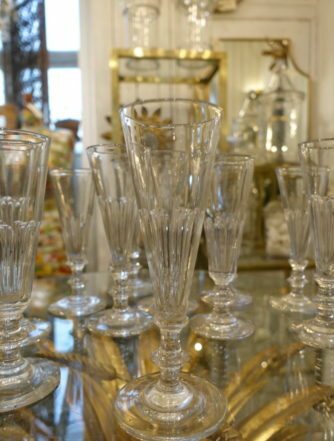 Drinks look elegant in our fabulous antique wine glasses, and should the evening extend through the night, our vintage tumblers (et la musique) get the party started!